Allied Master Strategists: The Combined Chiefs of Staff in World War II. David Rigby. Annapolis, MD: Naval Institute Press, 2012. Dr. David Rigby presents a thoroughly researched and meticulously detailed history of the Allied Combined Chiefs of Staff. This group of senior military leaders from the U.S. and Great Britain served as a “board of directors” for the Allied powers during World War II. Although a career military officer and a budding military historian, a negligible amount of my military education has focused on the Combined Chiefs of Staff and their strategic and diplomatic efforts to enable the U.S. and Great Britain to emerge victorious from the war. The author’s aim in writing this illuminating history is to prove that “the Combined Chiefs of Staff held the Anglo-American alliance together and was the most important organization for the formulation of British-American military strategy during World War II.” Although Dr. Rigby falls short in this endeavor, his work is worth careful study and consideration because it adds considerable research and thought to the study of the strategic and diplomatic leadership of the Allied powers during World War II. While this review will focus primarily on what Rigby’s shortcomings may be in Allied Master Strategists, it is worthwhile to first identify what he has done well. Rigby provides one of the first and most comprehensive histories of the Combined Chiefs of Staff aside from the individual biographies of several of the participants. Additionally, his careful study of the board of directors of the Allied victory in World War II provides ample opportunity to examine an untold story of the war and allows strategists and military histories an example of strategic lessons learned from World War I were applied to World War II and enabled victory. U.S. Officer Not Included: Admiral Harold R. Stark, Admiral King’s predecessor as the Chief of Naval Operations. By defining the membership of the Combined Chiefs of Staff and attempting to end academic debate between military historians, Rigby demonstrates his comprehensive knowledge with the subject matter and clearly offers a starting point from which to study the work of the Combined Chiefs of Staff. Rigby then offers short biographical sketches of the members to familiarize the reader with the key strategic military members of the U.S.-Great Britain alliance. He also clearly articulates the “also-rans” and his reasoning for leaving several well-known military officers outside of the defined circle of the Combined Chiefs of Staff. 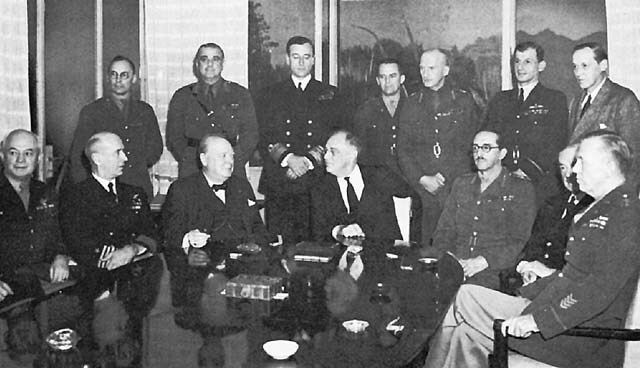 Roosevelt, Churchill, and the Combined Chiefs of Staff at Casablanca in 1943. The author decided not to outline the work of the Combined Chiefs of Staff through the multiple conferences of the war; rather he focuses on the Casablanca Summit of 1943, the “corporate-style organization,” and their regular meetings at the Public Health Building in Washington, D.C. Unfortunately, the author spends time and effort detailing the “very comfortable and efficient surroundings” in which they held several conferences, adding little substantive quality in this vein to the study of the Combined Chiefs of Staff. Rigby, however, provides a first-class synopsis of the Casablanca Summit, but he fails to prove the prominence of the Combined Chiefs of Staff. Rather he bases his contention on the fact that most of the meetings of the Combined Chiefs of Staff took place without the President or Prime Minister in attendance. While the author may not establish the primacy of the Combined Chiefs of Staff, he leaves little doubt as to the motivation of the organization. “The collective memory among Combined Chiefs of Staff members, all of whom had been in uniform during World War I, of how badly the alliance that finally muddled through to victory in World War I had been mismanaged created a desire to cooperate more effectively in order to achieve better results the second time around.” The author clearly shows this motivation as he discusses operations in the European Theater, specifically Operation Overlord. Rigby believes that the appointment of the British Lieutenant General Frederick Morgan by the Combined Chiefs of Staff to serve as the Chief of Staff to the Supreme Allied Commander of the Allied Invasion of Western Europe served as the impetus to resolve the British doubts of the cross-Channel attack. As I started this book, the question in my mind was who or what formulated the allied master strategist group and how that organization set the Allied partnership on the path to success. Unfortunately, as I finished Rigby’s well-researched effort, I am still left wondering if Rigby’s contention that the “Combined Chiefs of Staff was the most essential element for the conduct of successful Anglo-America cooperation” is true. Rigby adroitly lays out who constituted the board of directors and why, however, his book leaves this reading wanting more in the way of proof of his hypothesis. He leaves too many alternative explanations for success open for discussion, including the rise of the U.S. to primacy in its relationship with Britain, the importance of Soviet forces to the success of the Allies in Europe, and the operational-level of expertise evident in theater military commanders like Generals Eisenhower and MacArthur and Admiral Nimitz. However, it is important to understand that the members of the Combined Chiefs of Staff “willingly took on tasks outside of the strict definition of military science that had suddenly become necessary aspects of the role of members of a high command in modern warfare.” The collaboration exhibited in this British-American alliance was essential to both the Americans and British because it gave both an arena for strategic military issues to be discussed below the level of the President and Prime Minister. While this give and take discussion on issues may not rise to the level of master strategists, it definitely positively contributed to the war effort. That said, Rigby offers a well-researched and thorough documentation of the Combined Chiefs of Staff; Allied Master Strategists is a worthwhile read for any military historian or student of military campaign planning, especially as the U.S. finds itself involved almost exclusively in coalition warfare around the globe. Kenneth W. Letcher is a PhD Candidate and U.S. Army Strategic Planning and Policy Fellow in International History at the London School of Economics. The opinions expressed here are his own and do not reflect the official position of the U.S. Army, the Department of Defense, or the U.S. Government. Enjoy what you just read? Please help spread the word to new readers by sharing it on social media. Rigby, David, Allied Master Strategists: The Combined Chiefs of Staff in World War II, Annapolis, Naval Institute Press, 2012, p. 8.